Our Thanksgiving holiday week was definitely low key, with the surprise addition of a new family member. We had a Thanksgiving themed family home evening on Tuesday. 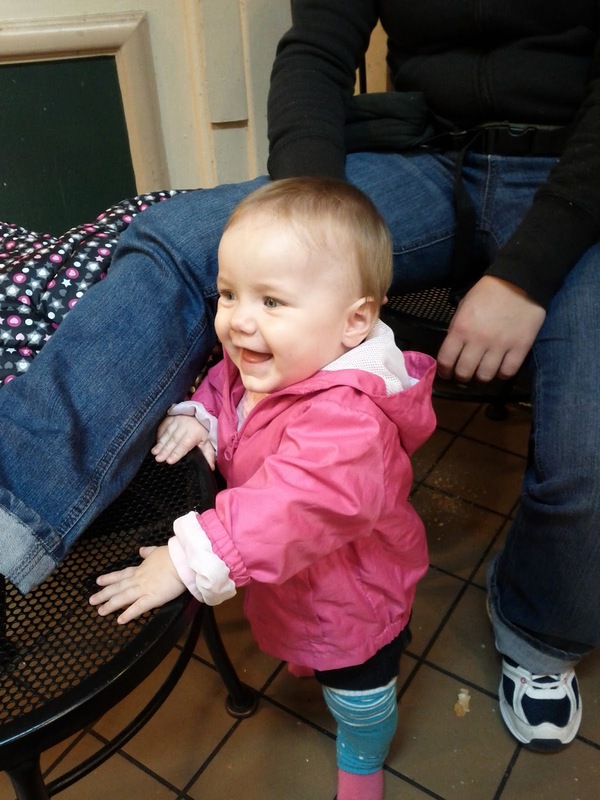 On Thursday, Todd took Jared and Eloise to Thanksgiving dinner with some friends of ours who had already invited us to get together with them before Benjamin's arrival. They brought me some turkey. 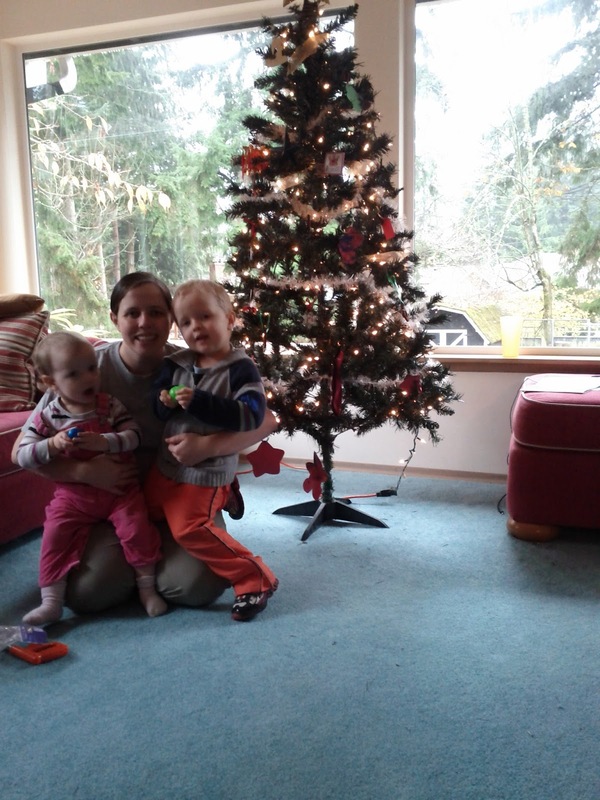 With Thanksgiving behind us, it was time to break out the Christmas decorations! 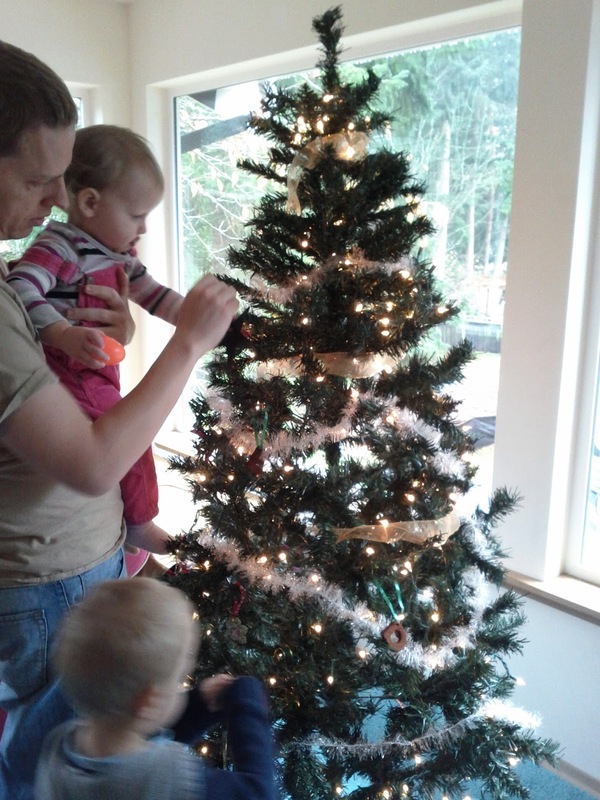 The first order of business for Jared and Eloise was to raid the holiday decorations box for anything fun. 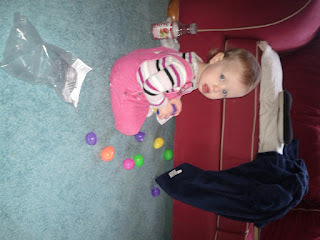 All of our holiday decorations fit in one box, so here is Eloise ringing in the Christmas season with a bag of Easter eggs. 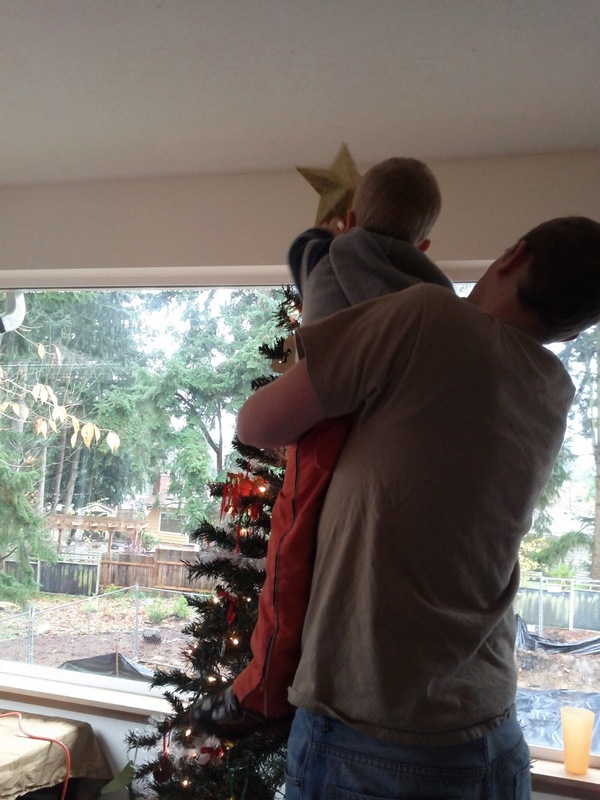 Jared remembers decorating the tree with Grandpa Knight last year, so he was very excited to pull out the Christmas decorations. 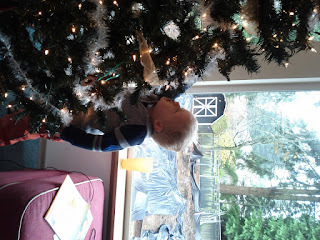 The challenge now is to keep him from unplugging and replugging the Christmas tree lights twenty times a day. 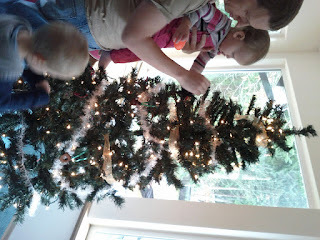 Most of the ornaments have already been rehung a few times since these pictures were taken. 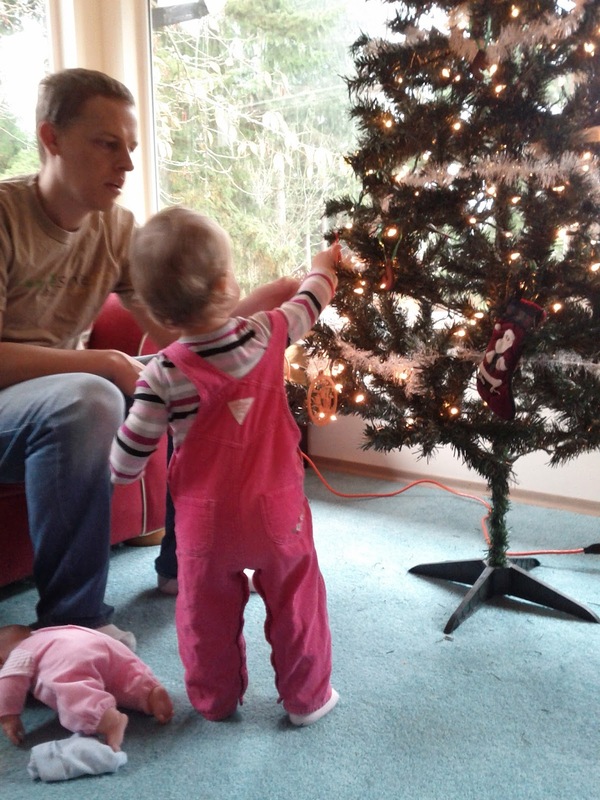 Eloise doesn't remember Christmas, but she is excited. 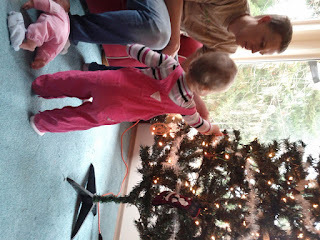 She was most excited to find some ornaments that smelled like cinnamon, or, as she says, "cinnaminiminimin!" There is also an ornament which says "Princess" on it. As we all know, that is Eloise's preferred name. 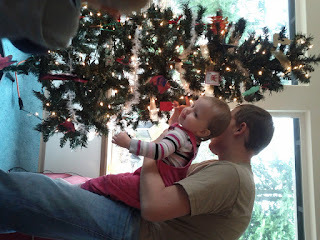 That ornament hasn't spent much time on the tree, since she is usually carrying it around. 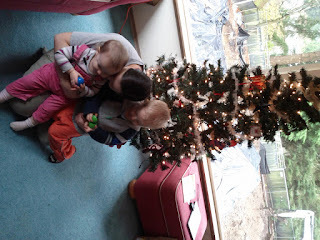 We came home from the birth center last Monday to find progress finally being made on the house next door. 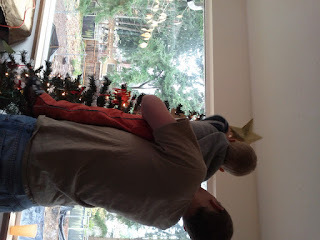 Jared and Eloise have been glued to the window since they brought in a tractor to knock down trees and dig a pit for the house. At the end of each day's work, they cover the whole lot with tarps to protect their work from the rain. 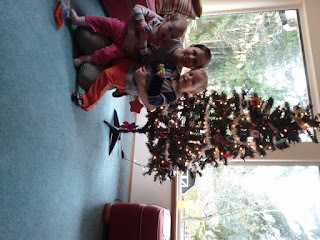 We put all of our lights, ornaments, tinsel, and ribbon on the tree. . .
. . . topped it with a star. . .
. . . posed for a Christmas picture (complete with Easter eggs). . .
. . . sang some Christmas carols, and enjoyed a cup of hot chocolate and some leftover pumpkin pie. 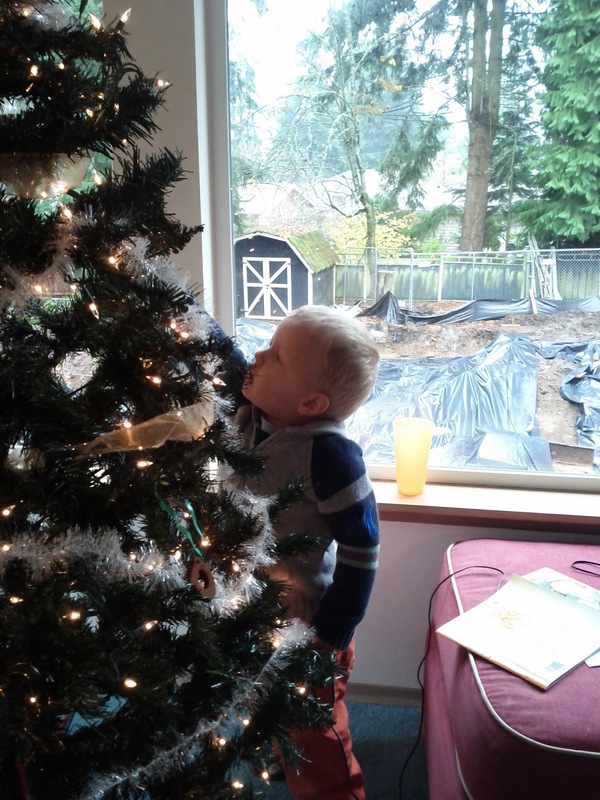 Bring on Christmas! The Knights are ready! 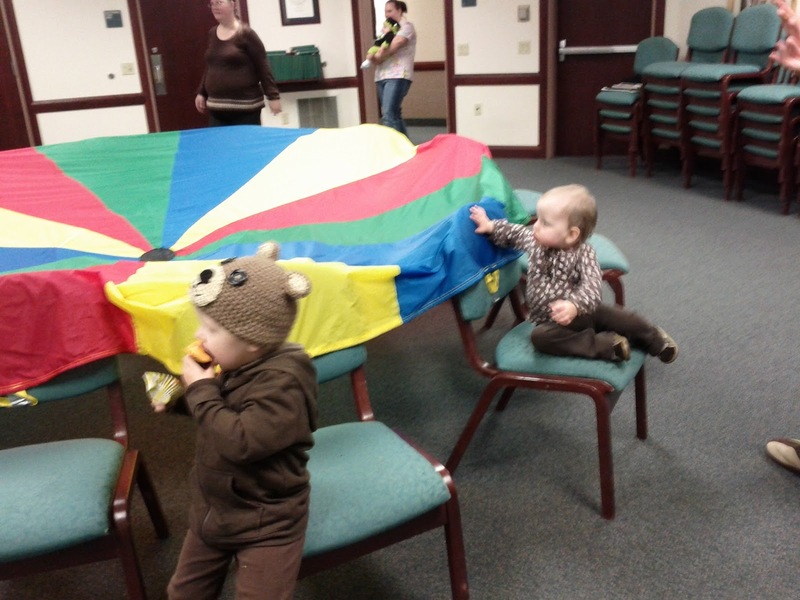 On Saturday, November 17, Jared and Eloise decided to help get things ready for baby to come by warming up the cradle for him. 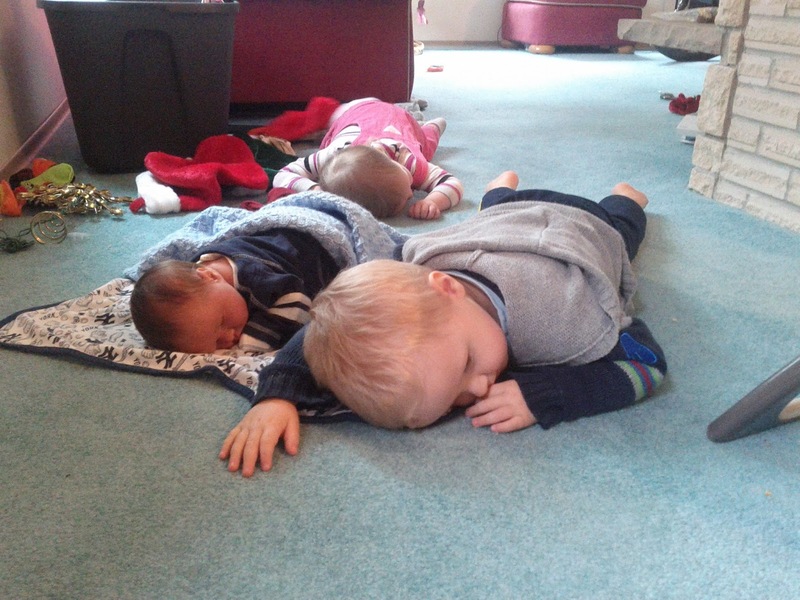 I was pretty sure that their efforts were wasted, since baby wasn't due until December 9. That put me at 37 weeks pregnant on November 18. According to Jared and Eloise's arrivals, we could expect three more long, grueling weeks of pregnancy before meeting our new baby. 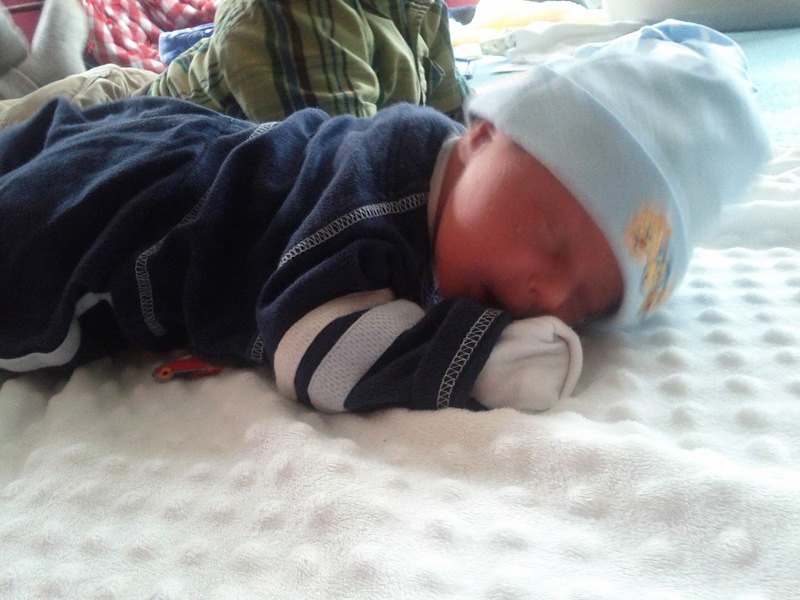 I woke up on November 18 at 4:45 a.m. having painful contractions every 15 minutes. This has happened before. The contractions usually keep me awake for a few hours, then taper off. This time they kept going into the day, but stayed 15 minutes apart. 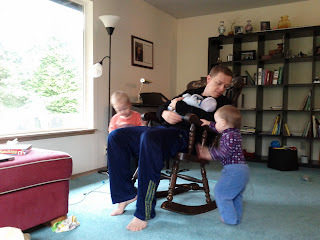 I managed to get a nap in the afternoon, so I was pretty sure that these annoying contractions were on their way out. At bedtime, when they were back in full force, I was pretty tired, but since I was scheduled to see my midwife in the morning, I decided I would just tough out the night, and then see if I could get some relief from the midwife at my appointment. I managed to get two hours of sleep, and, when I woke up at 2 a.m., the contractions were ten minutes apart. I read for a while, texted with my mom, talked to Cheyenne, and remained convinced that I still had at least two weeks of pregnancy left. 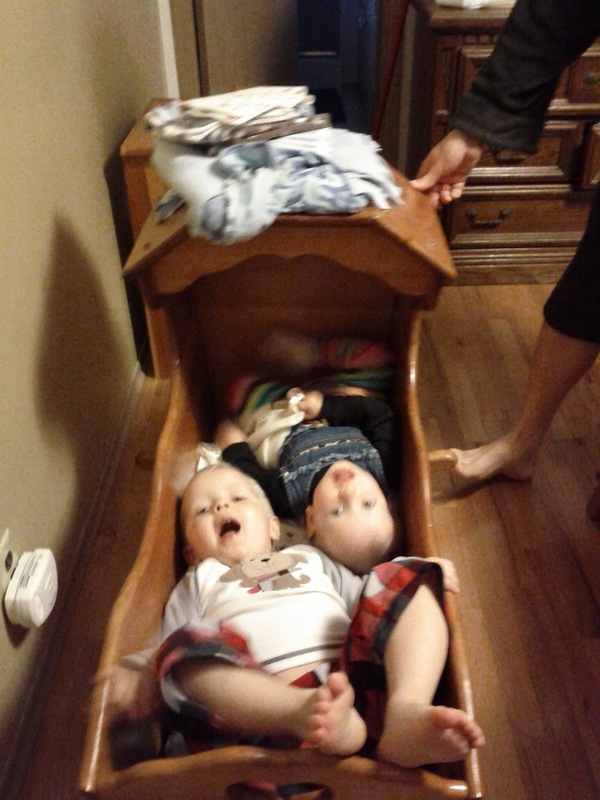 My midwife says wild weather brings babies. I know it is always raining in Seattle, but the storm on Monday, November 19 was a crazy one, even for the Pacific Northwest. Seattle got two inches of rain in six hours (Tucson gets an average of 12 inches of rain a year, to give you Arizonans some perspective), and many roads were closed as drains overflowed and roads became rivers. Active labor started the moment I got up, at about 7:15. By the time I was done getting breakfast ready for the family, it was pretty obvious that the baby had picked this very early date for his arrival. I called a friend who had offered to take Jared and Eloise for an extended play date in the (we thought unlikely) event of baby coming early. 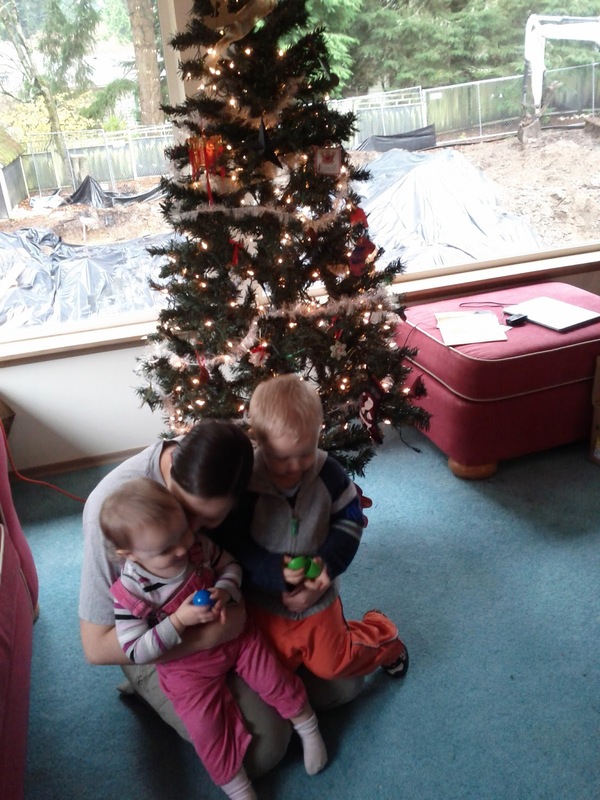 They weren't too excited about being abandoned for the day, and Jared was deeply upset that the baby, who I had promised after Thanksgiving, was actually going to come before. 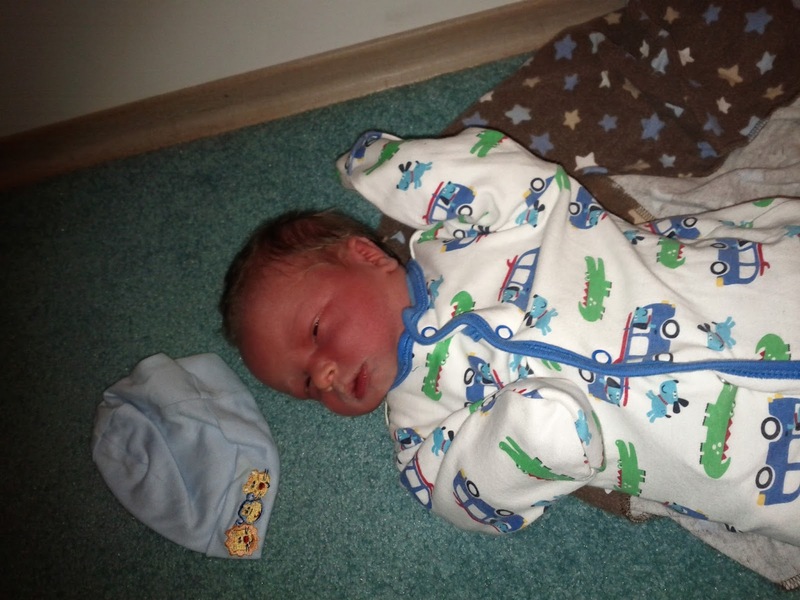 Then I called the midwife. I was having contractions every two and a half minutes. We left for the birth center in a torrential downpour in time to make it a few minutes early for the appointment I had scheduled anyway at 10, and were met by the midwife, Val, and two student midwives, Leah and Sarah. 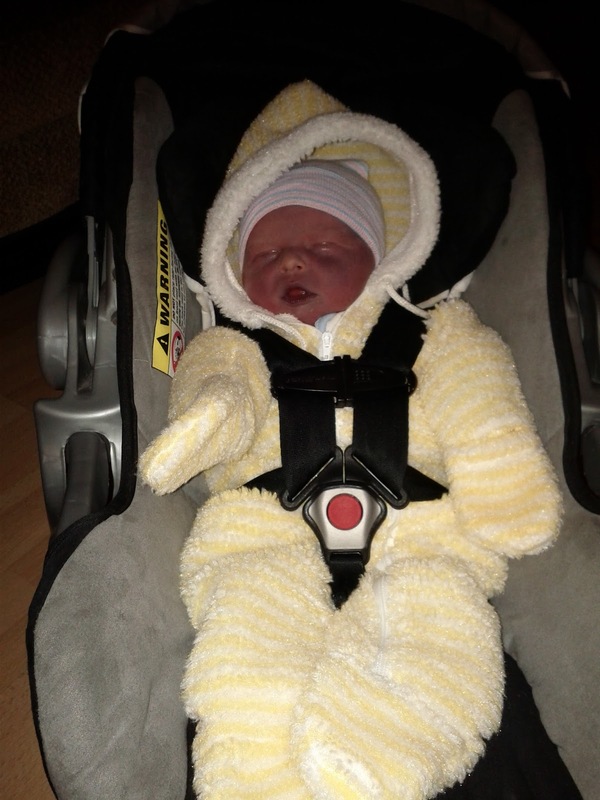 From the moment I knew I was really in labor, I knew it was going to be extra hard because I was so tired. All I wanted all day was a nap. I was ready to lie down and close my eyes for a few seconds between every contraction, but Val and Todd wanted me to be more active so that labor would progress faster. 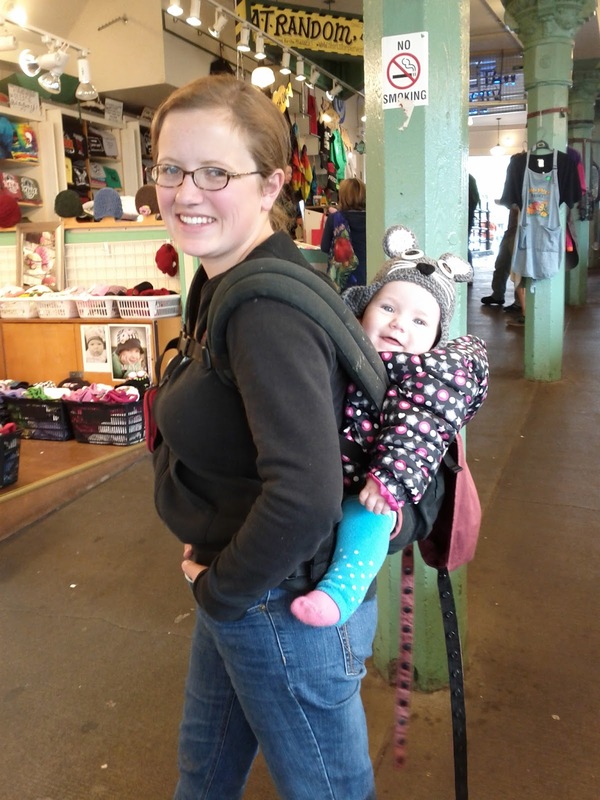 They were worried that all of the contractions I had been having would wear my body out for delivery, so I had to keep moving. I'm glad I did. Todd is getting quite expert at being my labor partner. Labor went pretty smoothly. I was all gung ho to deliver in the bathtub, but I got too hot or something in the water and had a scary moment hyperventilating, so I had to get out of the tub. I thought that my water would break on its own, like any normal person's, but I dilated to 10 cm and got stuck in the most difficult part of labor. With both Jared and Eloise, the doctor broke my water and labor suddenly became very fast. Todd had been joking all day about my water bag made of kevlar, and encouraging me to get it broken so that we could pop the baby out and go home. It turns out he was right. 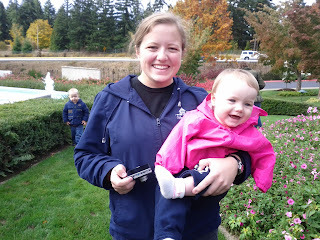 When Leah broke my water, she had to be poised to catch the baby. He was out in two big pushes. I was exhausted, but he is perfect. He came out with a purple face (bruised from delivery) and a full head of hair. 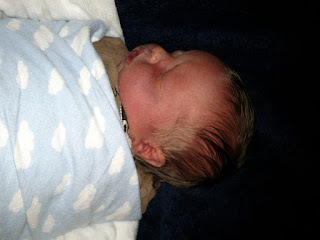 If I hadn't pushed him out, and if he didn't have exactly the same newborn face as his brother and sister, I would be convinced that we had the wrong baby. I didn't know we could make them with hair. 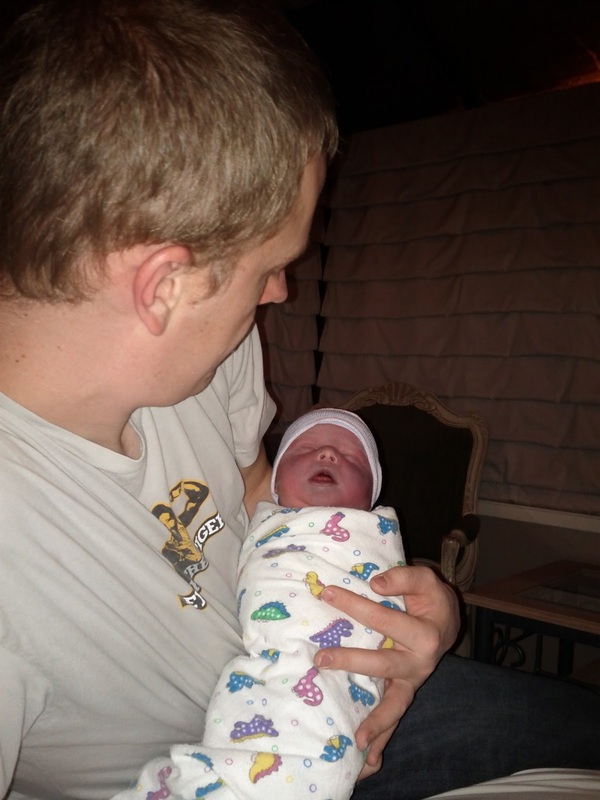 He was born at 3:04 p.m.
We named him Benjamin Kent Knight. He weighed 7 lbs. 4 oz., and was 20.5 inches long. 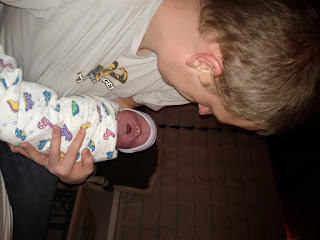 Here he is with his papa at the birth center an hour or so after delivery. After four hours of recovery, we headed home. 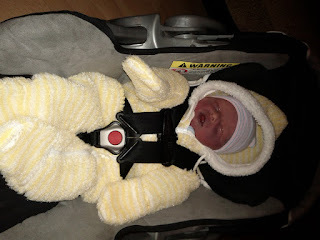 Here is Benjamin getting ready for his first car ride. 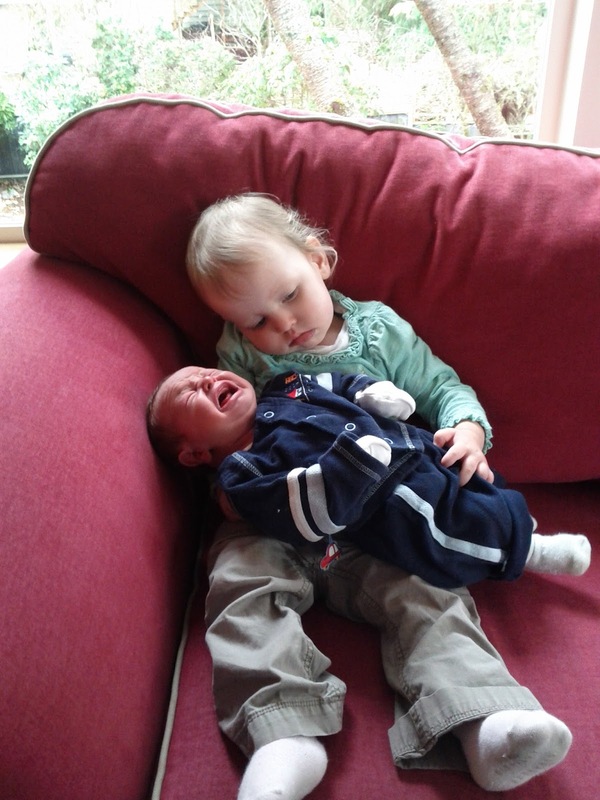 Jared and Eloise were excited about their new baby brother. Todd dropped Benjamin and me off at home and went to pick up Jared and Eloise. 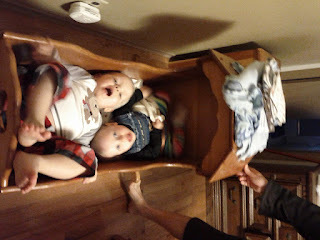 They came running into the house a few minutes later in their pajamas, both yelling, "Baby Benjamin! Baby Benjamin!" Eloise came up to us, peered into his tiny face, and demanded, "Hold baby!" 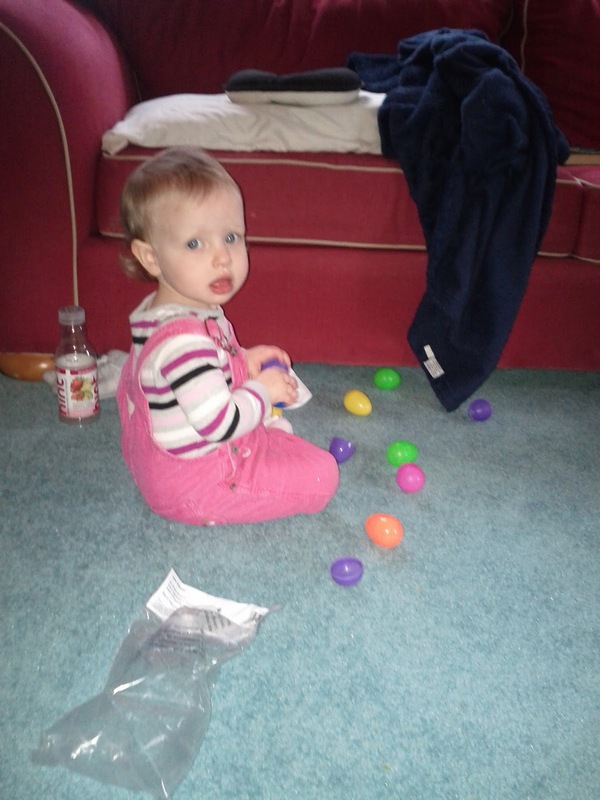 We gave her a new baby doll to hold instead. Jared got a new book as a gift from the new baby. We waited a day and a half to wash his hair. Here he is after his head wash. He is a handsome little guy. He doesn't open his eyes very much. In the first moment after birth he opened both eyes wide, but he must not have seen anything worth looking at, because his eyes have been closed most of the time since. His eyes are actually a little bit swollen from delivery, so when he does open them, he peeks out through slits. 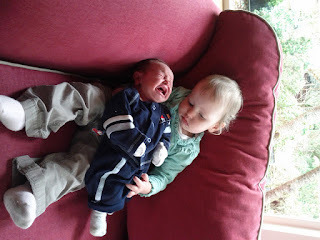 We finally did let Eloise hold the baby, but he wasn't too excited about it the first time. Here is Benjamin's first tummy time. I put Benjamin down to sleep on the floor next to the table when we were eating lunch yesterday. 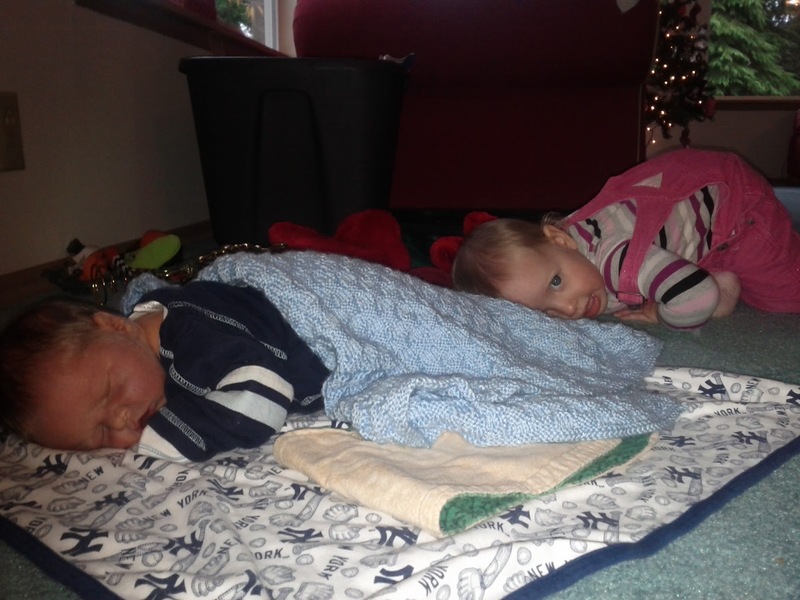 When lunch was over, Eloise made a game out of pretending to sleep near the baby. When Jared finished his lunch, he joined the game. Here are my three little babies. 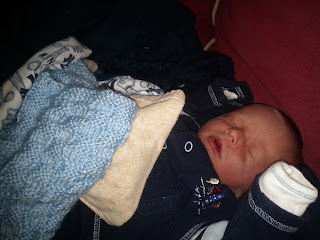 I never did get that nap I was promised when I was in labor, but I knew that sleep with a new baby is an elusive dream. 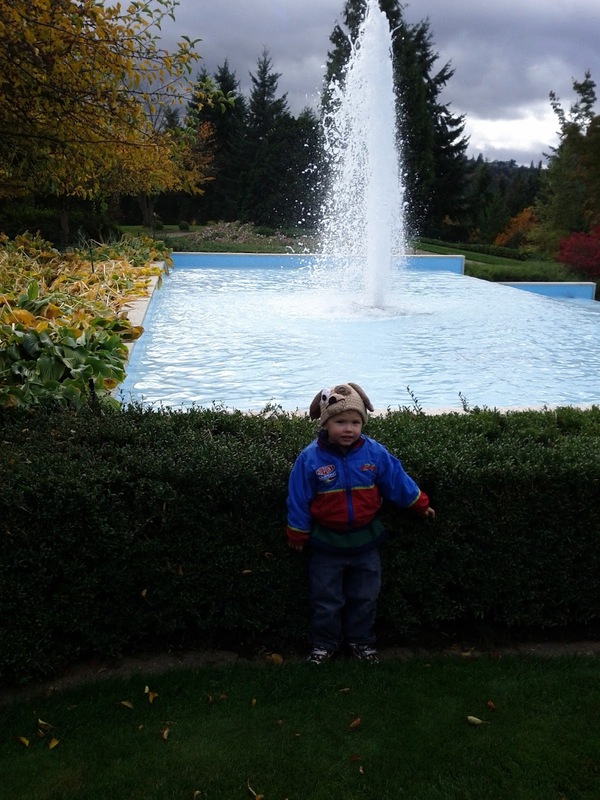 This precious little man is worth all of the sleeplessness. 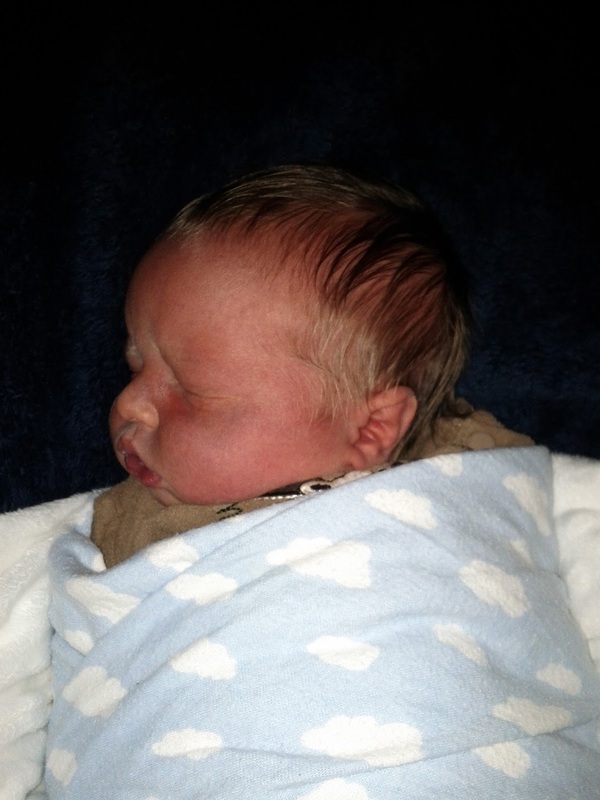 Welcome to our family, Benjamin! We are looking forward to all of the new adventures you will bring to us. Todd had a birthday on November 4. I'm afraid it was a terribly unspectacular day. 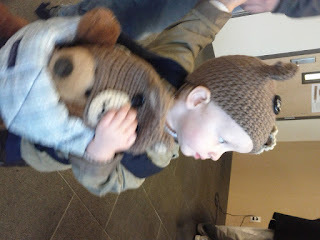 We are saving up our big celebration for next year when he turns a multiple of ten. 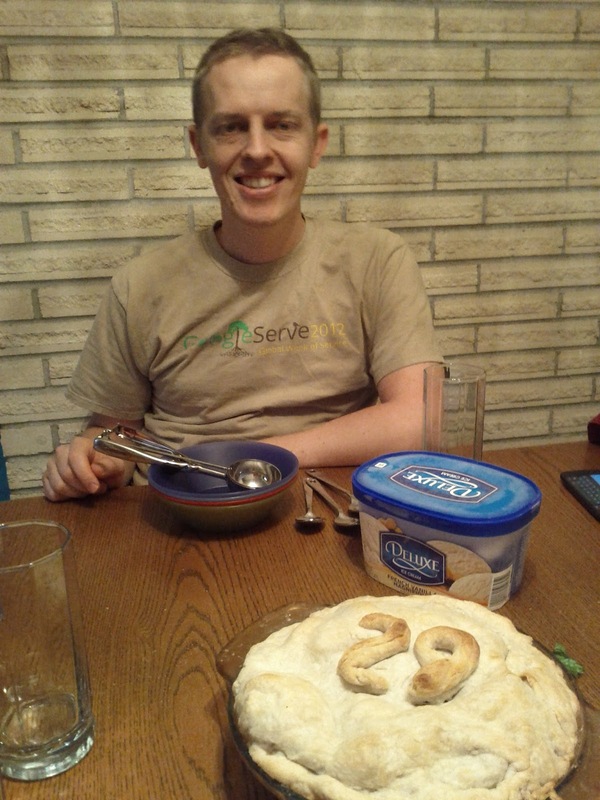 All the same, 29 is a nice, big prime number, so Todd is happy to call it his own for the next year. 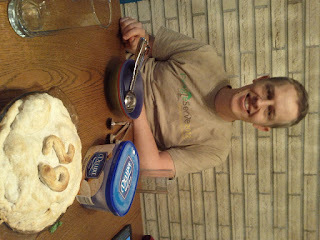 According to tradition, since Todd was turning an odd number, we made a birthday pie. This year it was apple. Todd said it was okay for me to bring home sixty pounds of apples (which he had to carry for me), as long as he got a pie out of it. Sometimes I wonder what myself from ten years ago would say if it saw me now. What would about-to-go-on-a-mission Todd say if he saw father-of-three, living-in-Washington, software engineer, recently promoted, still-playing-video-games-with-Dan, handyman, homeowner Todd? On the other hand, some things never ever change. I'm sure the Knight family recognizes Todd's general conference watching face. 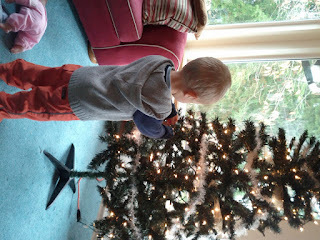 Now he just has a three year old version of himself (also a prime number) to follow his example. Happy birthday, Todd! We may not have had a huge celebration this year, but I wouldn't trade any of the last seven birthdays we've shared. I love you more now than ever. We all do. Jared and Eloise LOVE Halloween. 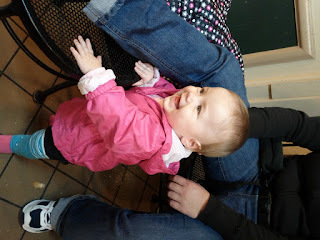 Eloise caught the excitement from Jared, and started saying "Hah-ween! Yay!" a full week before Halloween actually happened. She is still saying it at intervals throughout the day over a week later. 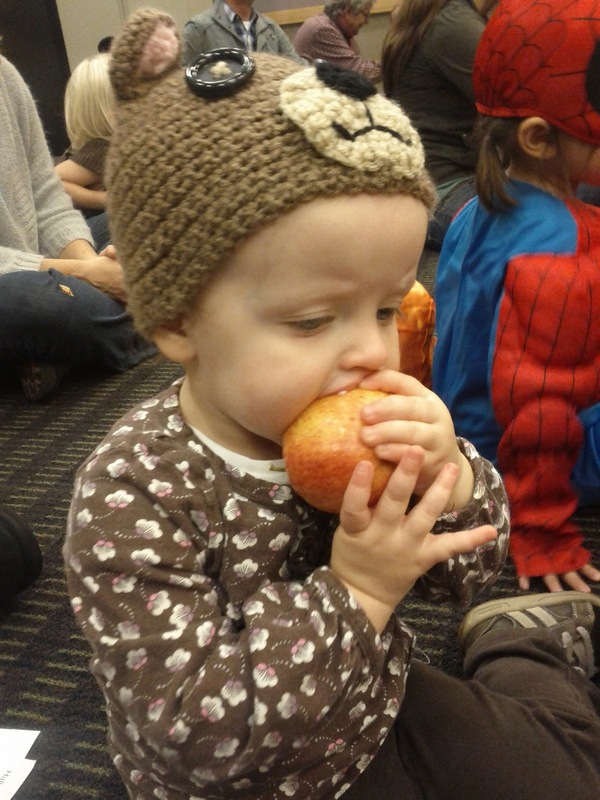 Our first opportunity to dress up this year came at our church's fall festival on October 27. We had a great chili dinner a bunch of activities for the kids. 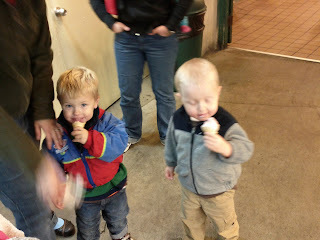 Both of the kids were fighting off a cold, so they didn't last very long before we had to head home for bed. Here they are at the cake walk. 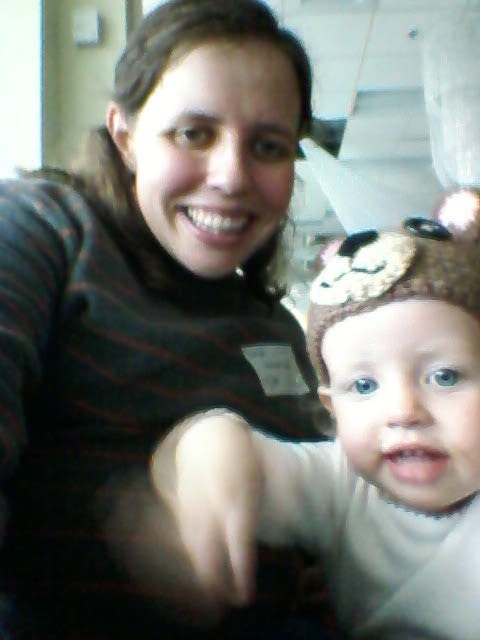 Halloween day happened to fall on a Wednesday, which is our regular story time day. 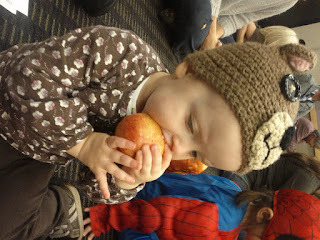 Here is Eloise in her brown bear costume, breaking the "no food in the library" rule. There are days when that rule seems much less important than it is on other days. After a Halloween themed story time, our librarian, Bernice, led the children around the library in a costume parade, ending with a little trick or treat at the information desk. Here are two brown bears in the parking garage after story time enjoying treats. 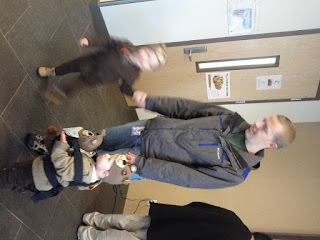 They were actually dressed as the three bears. 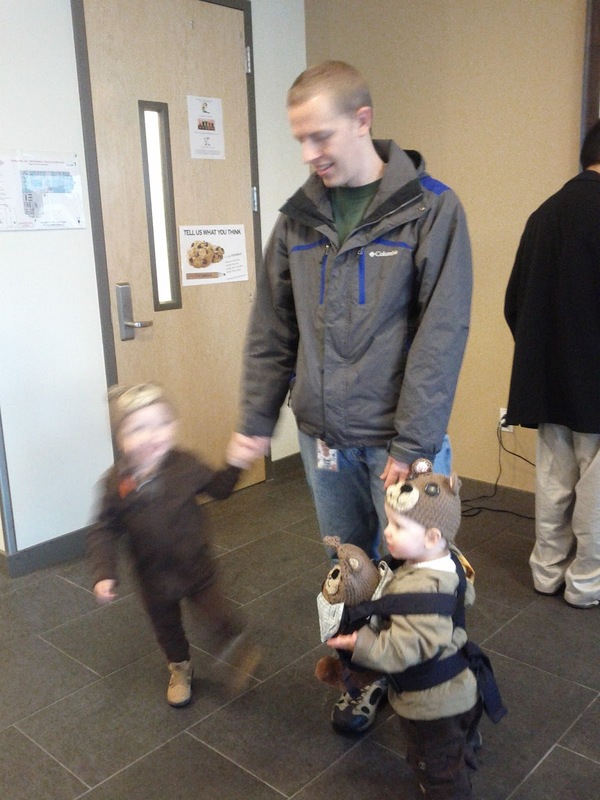 If you ask Jared what he was for Halloween, he will say, "I was a three bears." 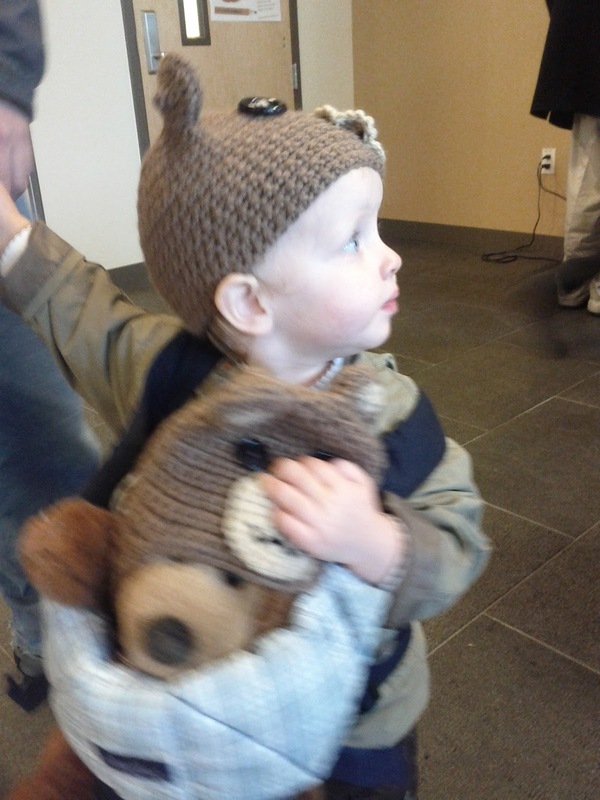 When we went to trick or treat at Todd's office after naps, Jared and Eloise took turns carrying their wee bear in a baby carrier. I got terrible pictures of the kids in their costumes because they were too excited to stay still for any amount of time. Jared has also made a game out of trying to make a blurry picture of himself. 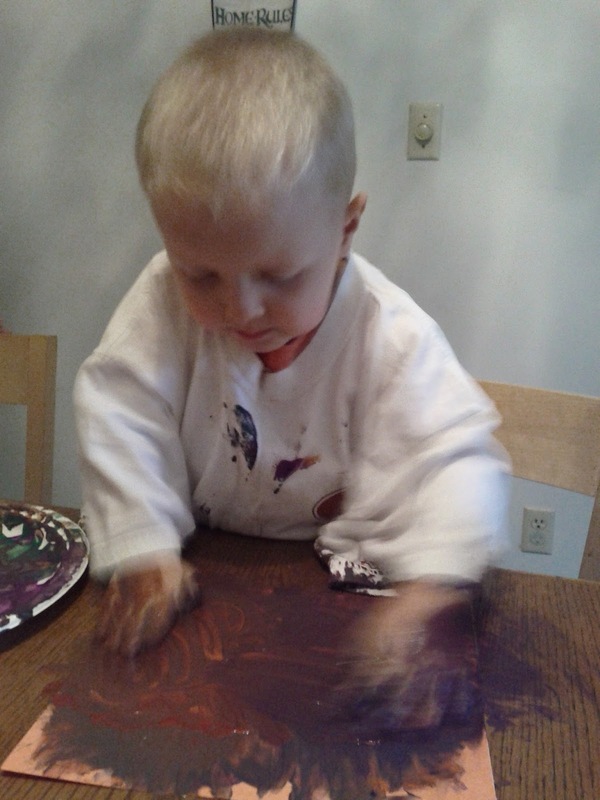 If he sees the camera come out, he will start moving like crazy and yelling, "Did you get a fuzzy picture yet, Mommy? Can I see? Is my face all smeared?" Apparently this costume, and being mama and papa bear, was a little bit confusing for Jared, as he said something later in the week that made it clear that he assumed that he would grow up to marry Eloise. I'm not too worried about that particular confusion. 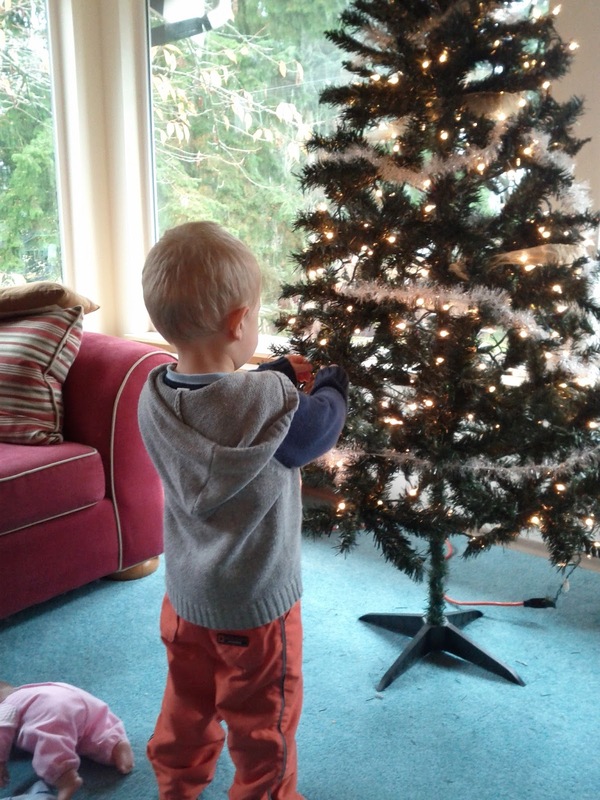 I'm sure it won't be long before he won't want to contemplate living with his sister forever. Eloise was a very cute little mama bear. 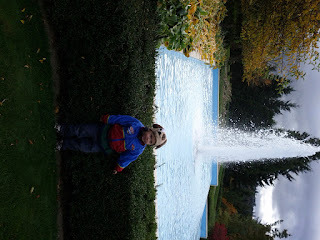 Jared would run for the candy bowl, pillage, and run in the opposite direction. Eloise was very careful to politely say, "Teat?" and then "Gank-oo." 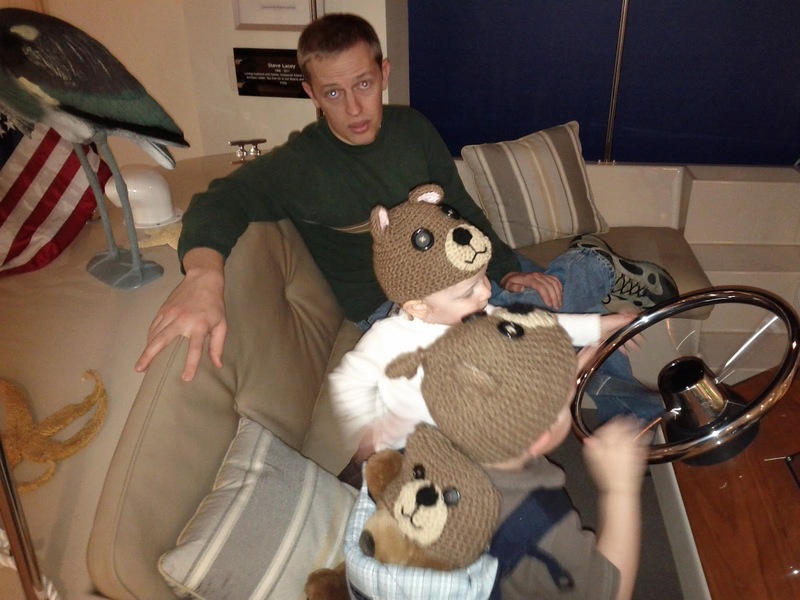 Here the kids take a break from trick or treating with Daddy to drive the boat/conference room. Yes, they legitimately have meetings in a real boat inside the building. Eloise loves to drive anything with a steering wheel, and Jared was fascinated by the dials and knobs next to the steering wheel, which are mostly light switches of one kind or another. This is the best way to trick or treat. We didn't have to deal with the weather, which was cold and rainy, and when we thought we had enough candy, we just went on to other activities. Possibly Jared's favorite part of Halloween was handing out candy when we got home. 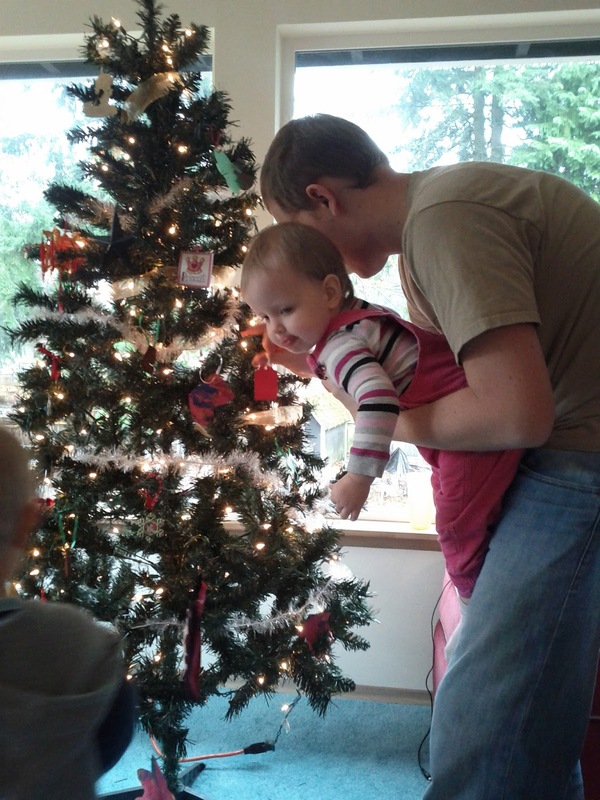 Any time we heard the doorbell ring, Jared would squeal, "Someone is here!" Then he would run for the door, do his best to hoist the giant bowl of candy to offer to the trick or treaters, tell them, "You can have two!" try to put candy in their bags for them, and then chase them out into the rain yelling, "Happy Halloween! HAPPY HALLOWEEN!" 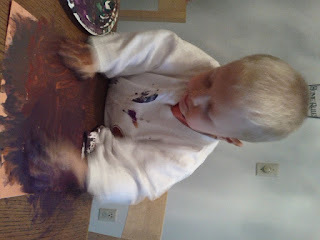 Eventually he went into the kitchen and found himself a smaller bowl to transfer some of the candy into. That way he could lift it himself. When it was time for bed, Jared helped Todd put the full bowl of candy out next to the door so that the trick or treaters could help themselves. On November 1st, Todd woke up to the sound of the front door opening, as Jared looked out to see if there was any Halloween candy left to eat for breakfast. The Halloween enthusiasm is fading slowly around our house. Our big challenge now is to get the kids all the way over Halloween so that they can start to get excited for Thanksgiving. Meanwhile, Jared is making plans to be a ghost next Halloween so that he can pop out and say "Boo!" After we took Faith to the airport, we drove straight to the pumpkin patch. 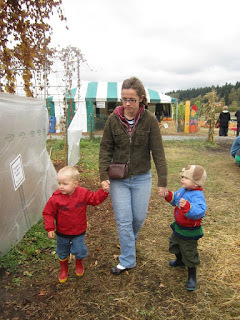 We went to the same pumpkin patch that we went to last year, but I was disappointed to learn that a lot of the things that were free last year were in a pay-for-entry part of the farm this year. Our kids are all too little to care. Thanks, Anni, for these pictures I pilfered. Maren was the most adorable miniature punkin. Jared was pretty excited about picking out a pumpkin. 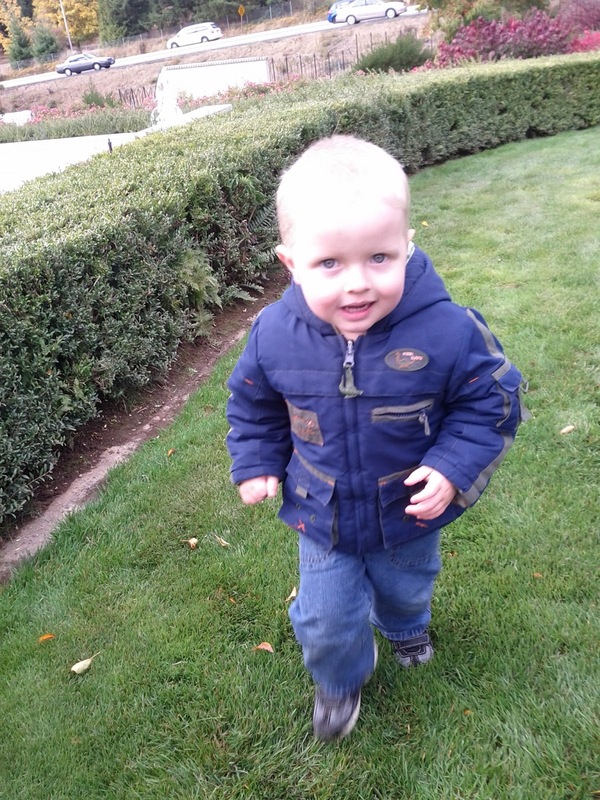 He recently discovered Halloween ghosts, so he was excited to find a little white "ghost" pumpkin. 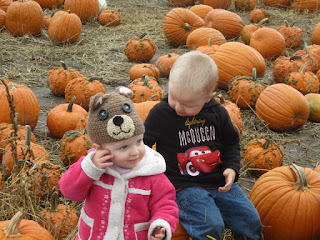 He also picked out a little orange pumpkin for Eloise. 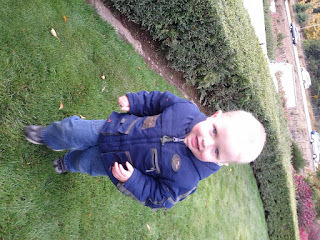 All of the kids who could walk were excited about the mud. It was a drizzly morning, so mud was plentiful. Jared and Eloise tried out the pumpkins as chairs. Cheyenne followed my lead and told Aaron he could have any pumpkin that he could carry. 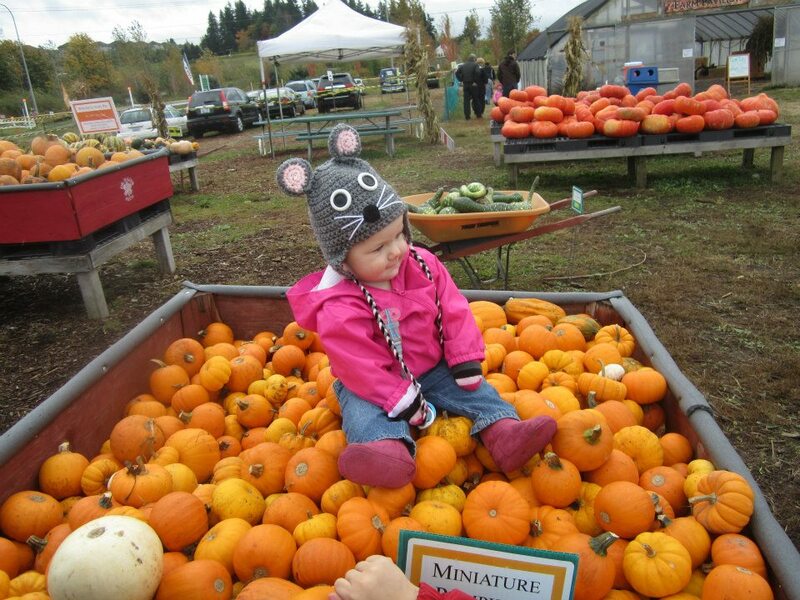 He showed a decided preference for tall, thin pumpkins that were partially rotten. 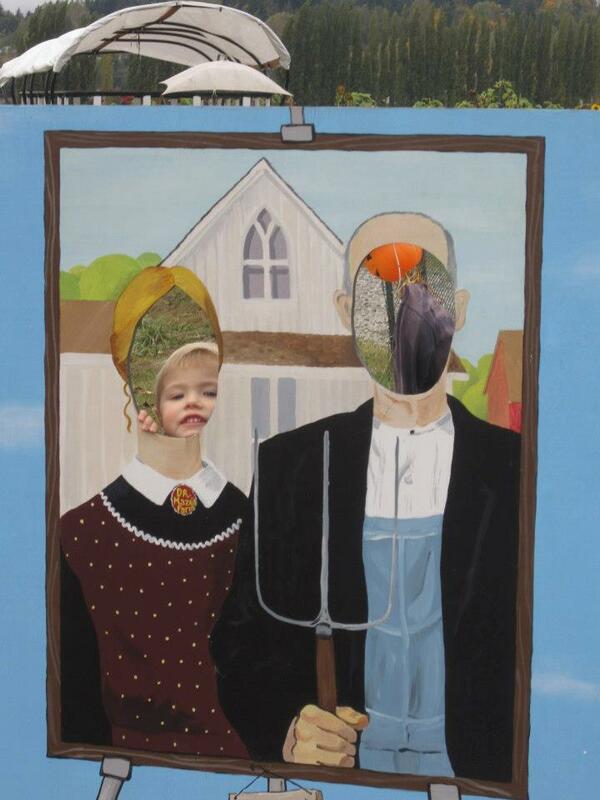 In the end, he was too interested in being part of American Gothic to settle on a pumpkin. We didn't spend too much time at the pumpkin patch before it got too cold and rainy, and we got hungry for lunch. We were there just long enough to bring home three filthy babies. 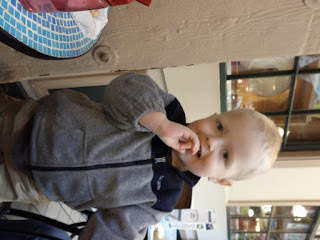 We spent Friday afternoon around the house, capped off with a delicious pizza dinner. Jared and Todd inform me that pizza on Fridays is now a fixed tradition in the Knight house. Anni and Maren had to head home early Saturday afternoon. We stopped at the temple on our way to the airport. Anni wanted to get some pictures of the temple in the daylight, and we dropped Todd off to do some temple work. 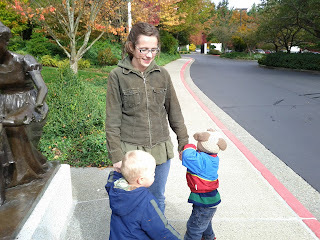 The wind was blowing and it was FREEZING outside, but the kids were pretty excited to be at the temple. Cheyenne's family lives several hours from their nearest temple, so seeing a temple was an extra special treat for Aaron. I think three of us were trying to get pictures of Aaron here, so he wasn't sure where to look. It was so fun to have Anni and Maren here. Even when she is exhausted, it is so easy to get Maren to smile. 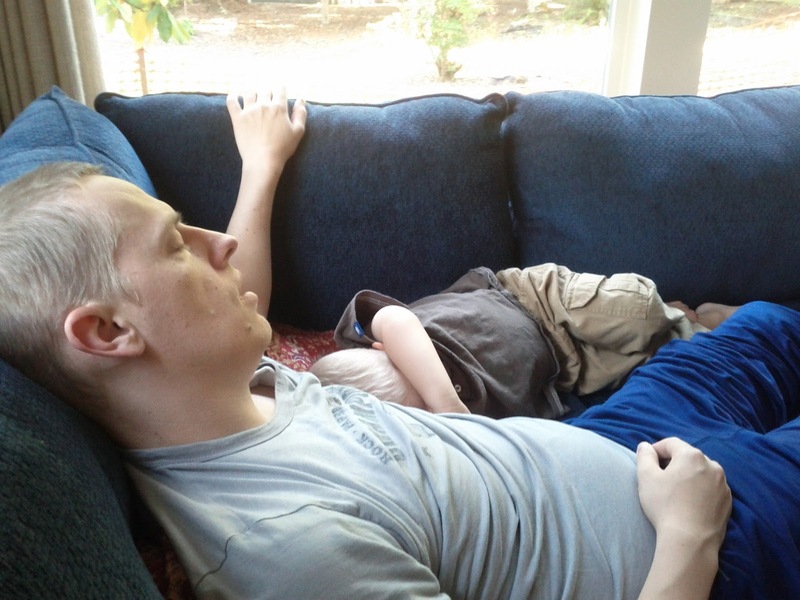 After Anni left, we were too worn out to do anything else. We thought about having a picnic, but it turned out to be too cold. Cheyenne and Aaron stayed through Sunday. 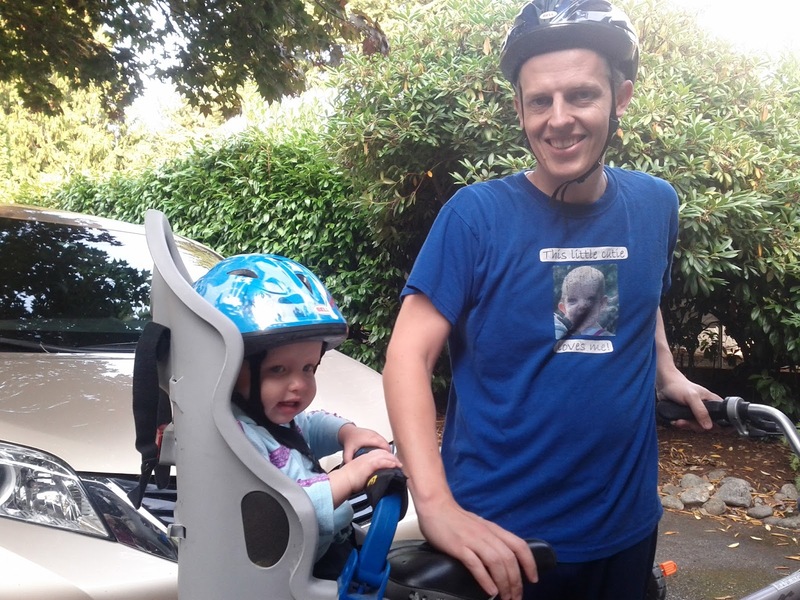 Aaron had been excited to go to nursery with Jared and Eloise (it was only Eloise's second week ever in nursery). It was the only thing he talked about before he came to visit. 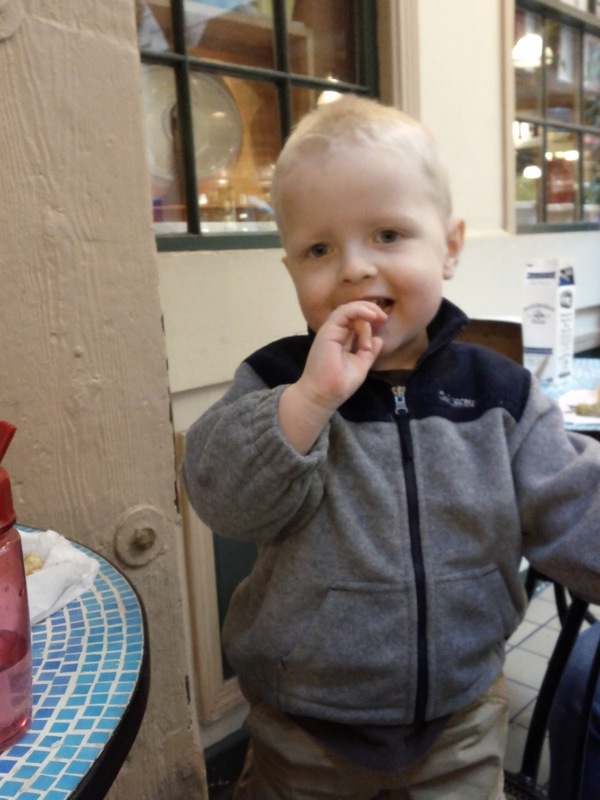 When it came down to it, he wasn't too excited to go to a nursery he didn't recognize. He eventually settled down and let Cheyenne go to Sunday school. I know it was hard on my sisters to be away from their husbands for a week, especially for the mamas with sleepless babies, but we loved having everyone around. I can't wait until we get a chance to get everyone together again. 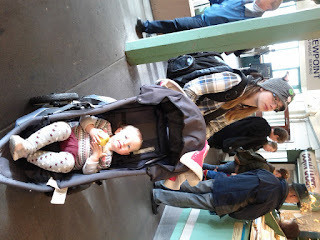 On Thursday, we went back to Seattle again for a trip to Pike Place Market. I've wanted to bring my sisters here ever since I first came. I knew that they would love the atmosphere as much as I do. 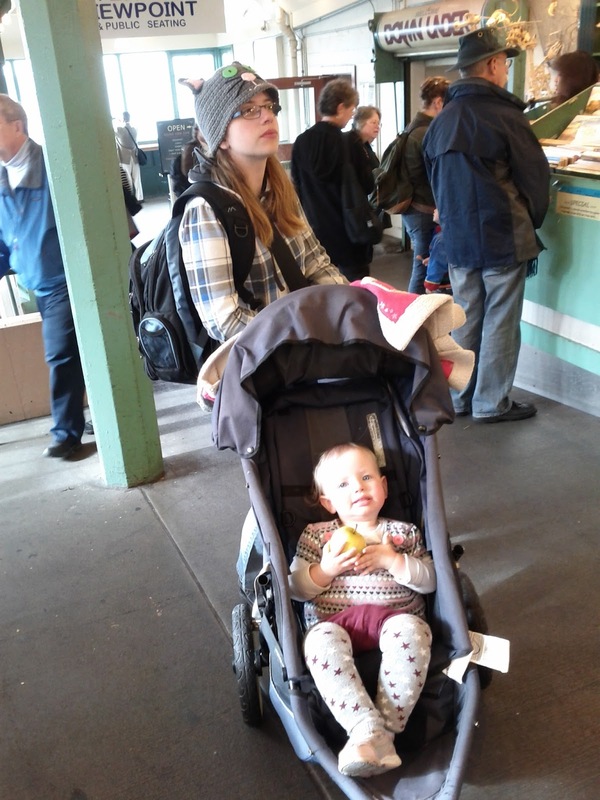 The market is much less crowded on a weekday morning than it was last time we came, on a Saturday. 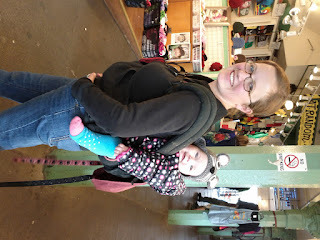 Maren was happy to experience the market on Anni's back. 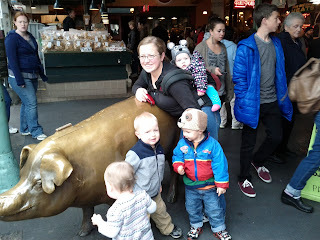 This is our best attempt at getting all of the kids in one picture with the Pike Place Pig. This is the picture I like most from the whole trip. 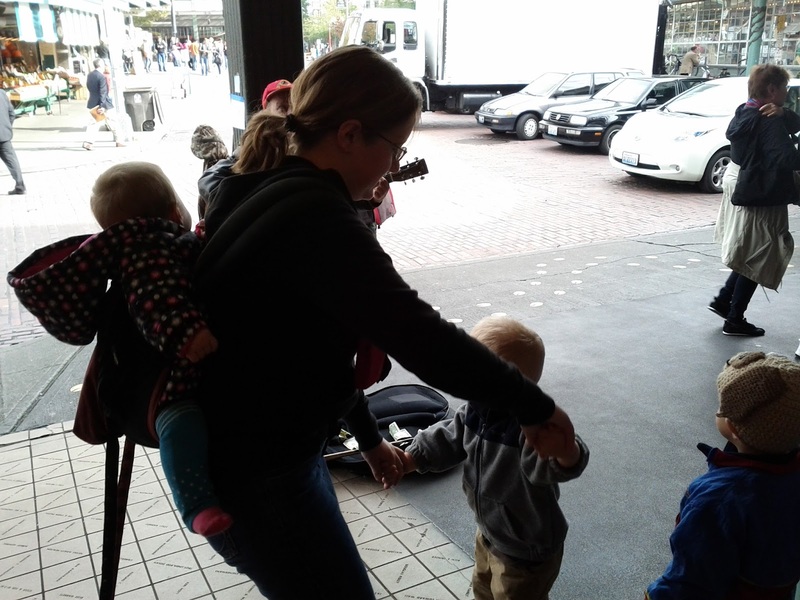 Anni, Maren, and Jared boogied to the music of a street performer. 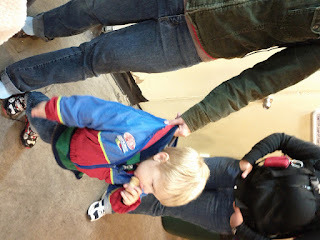 Our kids ate a lot of junk food in the market. Jared was most anxious to get some sweet nuts, so we got some cinnamon toasted almonds. There were also fruit samples around every corner, candy stands. . .
. . . ice cream, ethnic foods, strange flavored pastas, cheeses, jellies, and all kinds of sights, sounds, and smells to be absorbed. This picture captures the Cheyenne- Aaron relationship quite exactly. 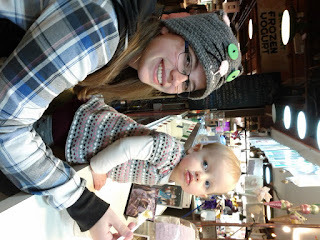 and feeding Eloise some ice cream so I could take Jared to the potty for the zillionth time. 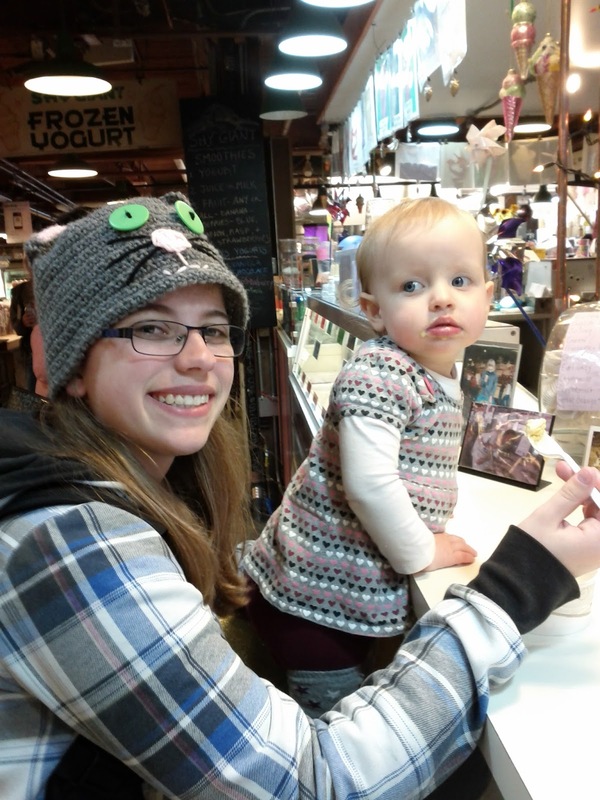 Did the kids enjoy the market? Why yes. 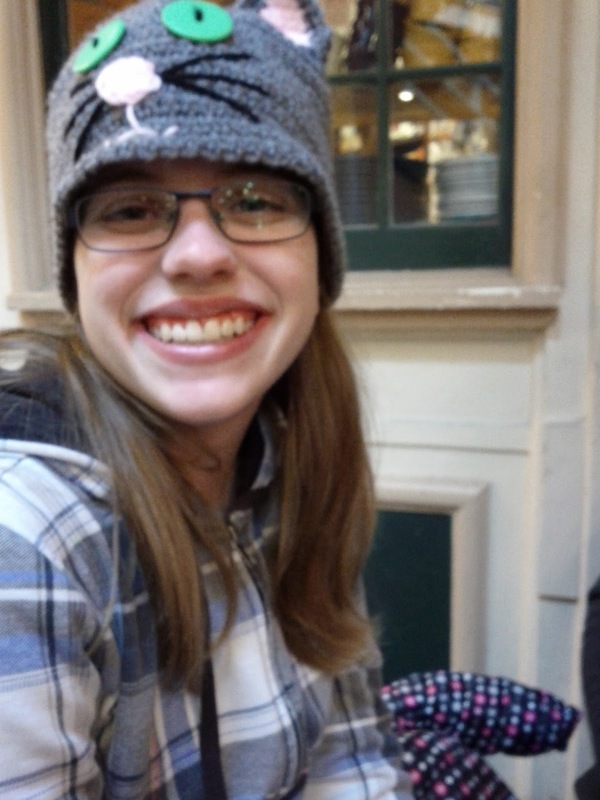 Don't take it from Maren, though, she is always smiling. Jared also loved it. He got too full on junk food to eat much lunch. That is just how three year olds like it. When we got home, Aaron and Jared decided not to nap, but Cheyenne was about to die of exhaustion, so Aaron and Jared painted. 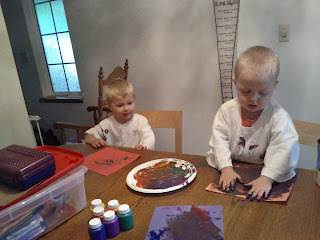 Rather, Jared had a tactile experience with paints, while Aaron looked on with mild interest, and did his best to avoid getting paint on his hands. Then they had a bath, which Aaron enjoyed much more. When Cheyenne woke up, I sat down to fold a pile of laundry, only to be surprised with a sisters baby shower! Anni, Faith, and Cheyenne had been planning to throw a baby shower for me all week. 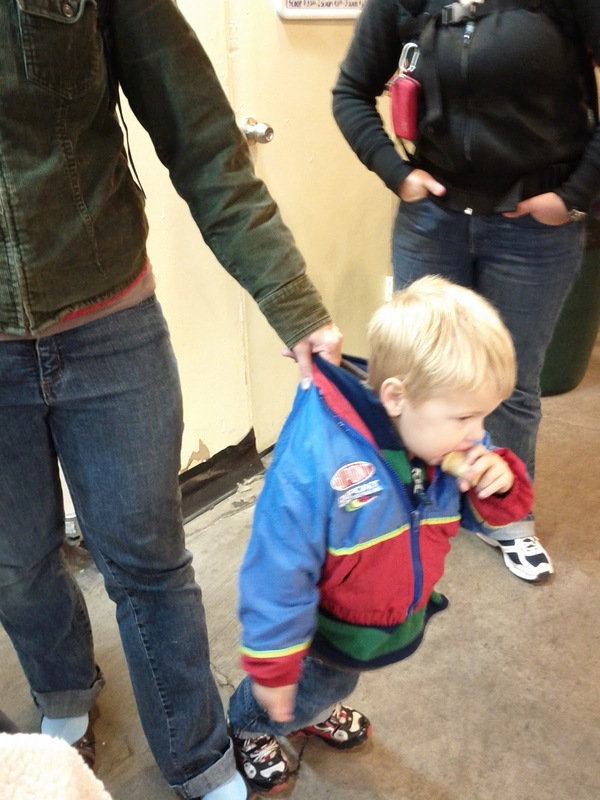 They each bought baby Knight a present at the children's consignment store we stopped at in Seattle, and they sent Todd to the grocery store in secret for treats. They even planned some baby shower games. I have the best sisters in the world. Later, Anni, Faith, and I went to the temple, while Todd and Cheyenne stayed home with the kids. 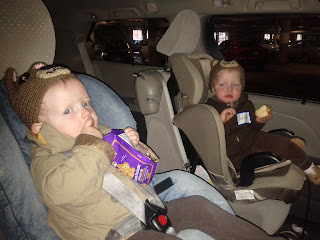 I was so tired by the time we came home that I was seeing double, so I had Anni drive. Unfortunately, Thursday was Faith's last day with us in Washington. 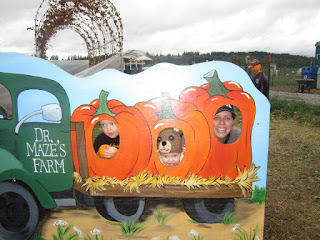 We drove Faith to the airport Friday morning before taking the kids to a pumpkin patch. 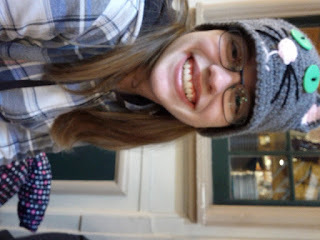 I forgot my camera, so I will have to borrow some pictures from Annika and Cheyenne before I can post about that. 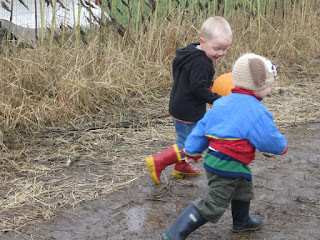 Aaron, Jared, and Eloise were pretty excited about the mud at the pumpkin patch.